1-800-PackRat has started to gain more popularity over the past few years both for its storage options as well as its moving services. Just like every other storage and moving company, there are a few characteristics that make it appealing, however there are some potential drawbacks as well. To give you a better idea about what it is all about, here is a quick 1-800-PackRat review. 1-800-PackRat has been around since 2003 and really started to expand in 2005 from its original three locations in North Carolina. Today there are location across the United States, however if you live in the western part of the country, you may have to search a little harder for a nearby location. They offer two basic services which is storage and moving. In the overall concept, they offer very similar services as PODS, in fact they provide side-by-side comparisons between the two. This means whether you are storing items or moving, they will drop the storage unit at your residence and then pick it up and deliver it to your new location for you. When it comes to storage, there are two basic “Pack-Rat” sizes – 12ft and 16ft. The 12 foot container can normally hold a couple of rooms whereas the bigger container can hold up to four rooms. One of the unique aspects of the 1800PackRat storage units is that they are made entirely of steel, which no other competitor offers. They currently have two different plans to choose from. The first is the basic plan in which you are not responsible for any damage to the container, however it does not protect your belongings. The Silver plan not only protects the storage container, but also your belongings, up to $75,000. Their storage facilities are climate controlled warehouses that have 24/7 video surveillance. If you need to access your container, you need to give them a 48 hour notice so that they can move it to a private staging area for you. They can also deliver it to your residence. Moving with 1-800-PackRat is fairly straightforward. They will deliver the unit to your residence so that you can fill it at your leisure The all-steel unit has a built in lock and is completely weather-proof. You can either load it yourself or take advantage of their loading and unloading services. Once you are ready to move, they will either deliver it to your new residence for you or take it to temporary storage which is at their warehouse. 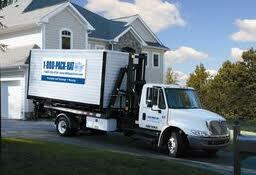 This is great if you are moving but need a few days between when you finish packing and want the unit delivered. As you can see, 1-800-PackRat offers an easy and convenient solution for both storage as well as full moves. They utilize the same concept as PODS, however their side-by-side comparisons highlights some important differences, such as the all-steel containers, content protection plan, and 24 hour guaranteed delivery. During this 1-800-PackRat review, there is little question as to why they could expand so much since 2005. They provide a much needed service in a very effective manner. Save 5% now off monthly storage fees by using a Pack Rat Promo Code. Read more portable storage reviews. PACK RAT IS A SCAM, RIP-OFF COMPANY. This is a well written article and the author has done his research. My friend used Rack Pack and got ripped off. First, she paid for insurance coverage. Because the move was made during a time of duress, she did not notice that they did not give her a contract for the insurance. At delivery, the pod had holes made by a fork lift. Apparently, this was to right the pod back up because they had rolled it, damaging furniture and destroying computers and other electronic equipment. She lost half of her property due to damage. She tried making a claim on the insurance. They wouldn’t let her and she couldn’t make a claim because she had no idea who the insurance company was as they did not give a contract. They advertise as “100% Satisfaction Guaranteed.” False advertising. If you look at their Yelp ratings, they are either way high or 1 or 2 stars only. Seems like a good experience with this company is on pure chance. STAY AWAY FROM THEM. Getting the pod was an OK experience. Drivers are nice. The delivery went well. They never “let me know”. I called but they said they are at a busy season so I cannot expect to get a quick pick up. Thus, I store 2 pods in front of my garage for almost 2 weeks. My new neighbors are upset before they get to know us…..Great.